Smoke from burning a bundle of incense sticks fills up spaces within the temple, while people await their turn to meet the head Bhopa. garlands and jewelry cramp together beneath the front awning to stay out of the rain. Behind them, a heavy-set man with long, black hair and heavy, beaded necklaces stands by the entrance of the temple. He carries a bundle of peacock feathers, which he waves around the bodies of worshipers as they leave offerings of rupees and stall goods at his feet. He is the faith healer, also known as a bhopa. In Banswara, an interior district of Rajasthan, traditional practices like faith healing are still thriving. The district sits in the basin of the Mahi River and is mostly rural, with rugged hills and dirt roads that wash away during monsoon season. Remote tribal villages, isolated from the epicenters of modern society, have been relying on faith to cure their ailments for centuries, long before the implementation of the Rajasthan Free Medicine Scheme (RFMS). Despite the general state-wide success of providing free, generic medication, doctors and district officials still struggle to gain the trust of Banswara’s population and to demonstrate the benefits of low cost, medical treatment from public institutions. Tradition, coupled with a high mistrust of government programs, have kept bhopas relevant in the twenty-first century. waiting in the same spot. A woman touches the walls of the temple that is commonly known as Kupra Maata Ka Mandir, situated 5 kilometres from Banswara town. 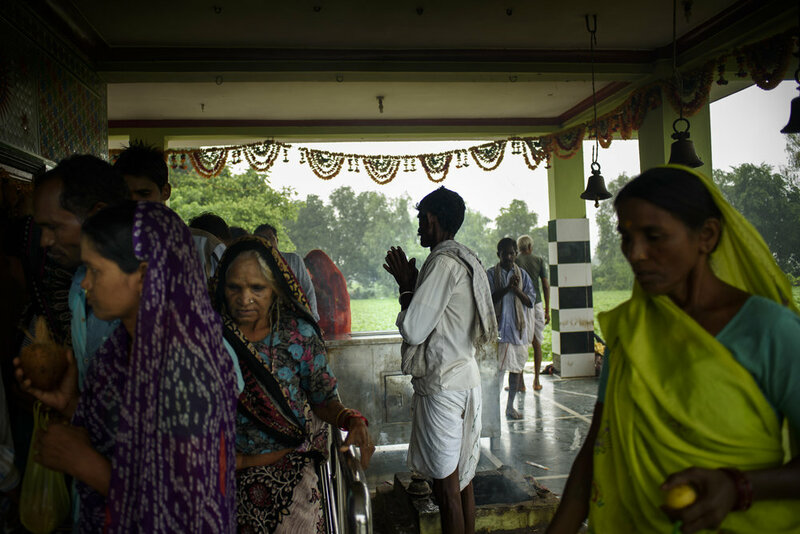 The villagers hold immense faith in healing through ceremonies that take place in the temple compound every weekend. A young boy takes the blessings of the head Bhopa. The people come in thousands to perform weekly rituals and offer a sum of money, fruits, garlands. People wait in a long queue to meet the head Bhopa and taste the holy water given by him. 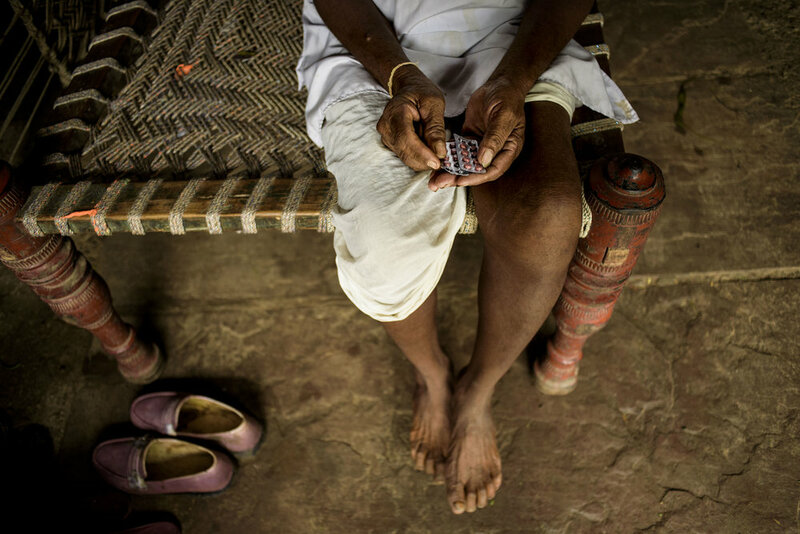 People with physical deformities and mental health issues seek help and treatment from faith healers, locally known as Bhopas. Dr. Amit Sharma, Banswara’s District Program Coordinator, walks through the aisles of a drug distribution warehouse (DDW). He once had dreams of becoming a military medic, but instead pursued the career of a clinician. He was then assigned to Banswara, where he works long hours in the office and District Hospital. In passing conversation, he mentions that he sometimes takes shifts in the emergency room at night. His office, a room that sits across from the DDW, is filled with his own paintings, one of which is an elaborate, wall-sized depiction of a Native American battle scene. “In the last two or three years, we have not had one single expired medicine and no shortages,” he says, a sense of pride in his voice as he observes the ceiling-high stacks of boxes of medical supplies, which range from catheters to snake bite antidotes. In a district like Banswara, where unpredictable demands and poor road conditions often complicate logistics, Dr. Sharma’s pride is not misplaced. He knows that a well-stocked warehouse can be the difference between life and death. “Each box is about forty to fifty kilograms, and we don’t have enough helpers to lift them to the top, so we keep them closer to the ground, but we never leave them on the floor,” he explains. behind accessible medicine. Despite staff and space shortages in Banswara, Dr. Sharma and his team have managed to keep the warehouse organized, clean and functional. The results of their work are most apparent in the treatment centers. Bhura sits in the courtyard of his house while he explains how the Mukhyamantri Nishulk Dawa Yojna has benefitted him. Bhura lives below the poverty line. With very little income to support a family, he feels relieved that the diagnosis and medicine are free of cost. Bhura’s prescription slip as given by the doctor, along with the medicines. Because he cannot afford a rickshaw, Bhura, a sixty-year-old farmer, walks three kilometers alone from his village to the nearest Community Health Center (CHC), located in Badrel, for treatment. 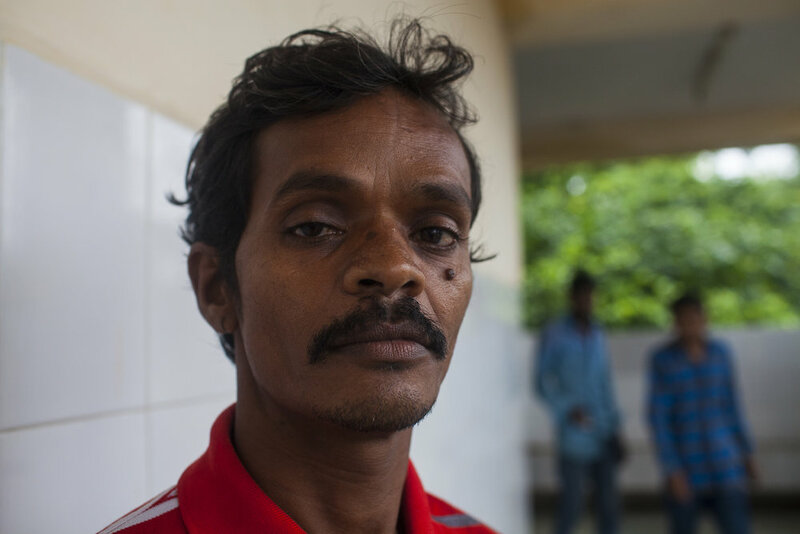 Two years ago, Bhura had a severe stroke and was admitted to the hospital in Banswara’s capital where he was diagnosed with tuberculosis. On a rainy afternoon, visibly weak and tired from the journey, he enters the office of Head Doctor Dr. Khushpal Singh Rathore and takes a seat on the floor. Using the staff of his umbrella, Bhura lifts his frail body from the ground. 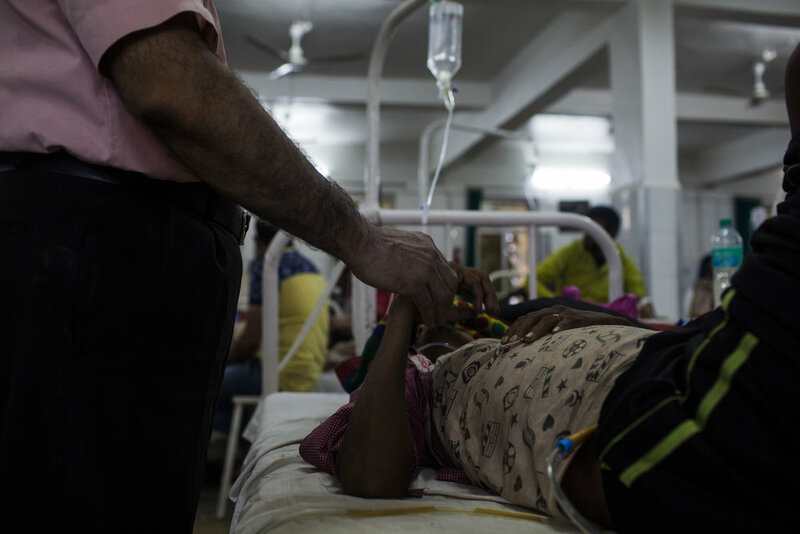 He moves silently through the health center’s quiet hallways to another room where he hoists the fabric from his dhotis up to his thighs and climbs onto a hospital bed. A nurse administers various injections. Without instruction, he gets up, takes a packet of medication from the Drug Distribution Center (DDC) and begins the difficult walk back home. Bhura, 60, is a farmer by profession. He lives with his wife in a village called Ambapura which is situated 3 kilometres from the Community Health Centre in Badrel. “Even though footfall has increased at the hospitals, there is still the issue of how and when people are seeking treatment,” says Dr. Amit Sharma. “Many come after months of experiencing an illness, others will go just to get an IV but then they won’t take the medication.” This issue, of getting prescriptions to patients and then ensuring that they actually take the prescribed medications, is one of the largest obstacles for the Scheme’s success in Banswara. In order to spread awareness about the benefits of the RFMS, teams of Accredited Social Health Activists (ASHAs) are tasked with visiting villages and educating locals about why it is important to seek official and affordable medical care. However, the steady stream of business for faith healers and uncertified private doctors, known locally as “Bengali doctors,” demonstrates that these efforts aren’t completely effective. Nathu Homa, 60, a patient of Acute Hypertension sits in the courtyard of his house in Ratanpura Village of Banswara District. A farmer by profession, he has been one of the many tribal people to be benefitted by the Mukhyamantri Nishulk Dawa Yojna. Nathu Homa, another sixty-year-old farmer from a small village, has been receiving free medication and treatment from the Badrel CHC for acute hypertension. He lives in Ratanpura in a tiny, bedroom-less house with his wife, son, daughter-in-law and brother. The house has one hallway and kitchen, where all five family members sleep and eat. The air is stained with the heavy scent of cow manure and grass and, with only a dim bulb for light, the hallway remains in complete darkness. While Mr. Homa has trusted the RFMS and the public health system to treat his condition for three years, his wife, who also suffers from acute hypertension, holds contrasting beliefs. In the faint glow of the kitchen lamp, she explains that generic medications do not help her illness. 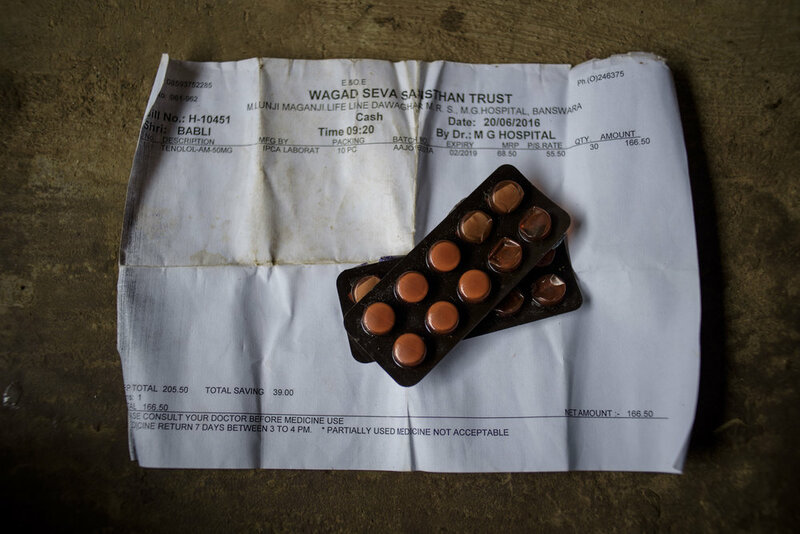 Instead, she buys drugs from a private medical pharmacy at a subsidized rate of 168 rupees ($2.50) per month— a large sum of money for a household that only sustains itself on a handful of cattle and odd jobs. Even though her husband is living proof of successful administration from the RFMS, she still denies its effectiveness. Nathu has been undergoing treatment for Acute Hypertension for the past three years at the Community Health Centre of Badrel. 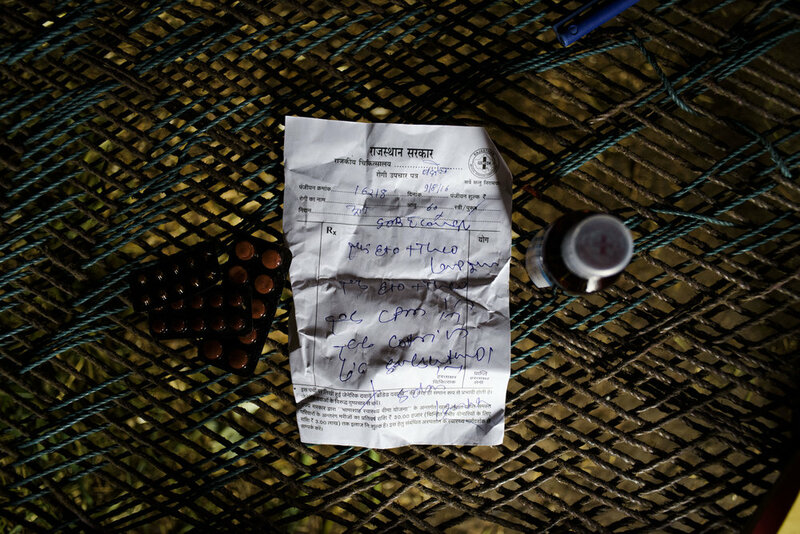 Nathu has never had to pay for his medicines or felt the need to consult a faith healer to treat him. Babli has been undergoing treatment for Hypertension for the past two years. However, she believes the generic drugs from the Community Health Centre do her no good. She chooses to buy her medicines from a private drug store which cost her a monthly sum Rs. 168. She is not the only one to have doubts against the efficiency of the generic drugs which is mainly due to misinformation and the lack of awareness. Babli, 50, is Nathu Homa’s wife. She is a housewife and also suffers from Hypertension. Babli’s daughter-in-law helps in the household chores. The Homa family is a nuclear one with Nathu’s son working also as a farmer. Stories like these are not lost on government officials. “Today you get free drugs, free diagnosis, free transportation, the poor people have been given a three lakh ($4,500) insurance and food security,” Banswara’s Assistant District Collector explains. This is the primary question that public health workers are trying to grapple with. Why, they ask, is the government failing to gain the trust of the people who can benefit the most from the Rajasthan Free Medicine Scheme? received little acknowledgement from official voices. While the government website of the Rajasthan Police explains the creation of the Mewar Bhil Corps as a solution to “the criminal activities of the Bhils of this hilly region”, the oral tradition of Banswara’s Bhil population has ensured that the massacre is not forgotten. For the tribal people of Banswara, this ongoing history has eroded their confidence in government leadership and programs. This mistrust appears to extend beyond the goodwill of the Rajasthan Free Medicine Scheme and its many advocates. Focusing on the present, public health workers are attempting to arrive at solutions to mend relations, at least to the point that tribes can receive necessary medical attention without going into debt, but century-old atrocities are not the only variables that the RFMS cannot control. the appropriate medications. It leaves little room for doctor-patient communication or developing an understanding of the cultural background of the person in front of them. On the other hand, faith healers are part of their patients’ cultural background. They share the same community, customs and religion. Banswara’s Assistant District Collector says that bhopas are a necessary evil. “[In places] where we cannot reach, we find that space occupied by Bengali doctors and faith healers,” he explains. Dr. Amit Sharma agrees. He says that faith healers can provide a sense of comfort and moral support that simply does not exist in large, public hospitals. The District Hospital is located in the center of Banswara’s capital, Banswara, known as the City of a Hundred Islands. The main road is filled with vendors, jewelers and hotels. Taxis, rickshaws and motorcycles weave between pedestrians and groups of schoolchildren. It has a population of over 100,000. It is a stark contrast to the surrounding countryside and its small villages. In the front waiting room of the hospital, patients and their families stand in disorganized lines before the check-in counter. Medical students dressed in scrubs rush from room to room. Those in critical condition are wheeled through the entrance on paper-thin gurneys before disappearing into the emergency ward, while others wait for prescriptions to be filled. A man waits for his turn to get an appointment with a doctor in the lobby of the Mahatma Gandhi Hospital, Banswara. The district hospital has experiences an influx of more than 800 patients per day. A young man in a wheel chair is urgently rolled through the crowd and up to the second floor to the Men's Ward. The room is claustrophobic. Every one of its beds, which are cramped in rows of ten with no more than two feet between each frame, is full. Confined to a wheelchair, he screams in pain and grasps his belly, which appears to be swollen. The ward’s doctor frowns as he scans the X-ray and explains that Jiva has multiple gastric perforations, holes in his stomach. Jiva’s family members tenderly lift him from the wheelchair and lay him down before the nurses give him an IV, painkillers and catheter. Jiva’s cousin Gulab takes a break outside. He is a short man with a regal mustache, lazy eye and commanding posture. Despite his illiteracy, he is acutely aware of his cousin’s condition. This is not the first time Gulab has brought someone to the district hospital for treatment. Back inside the ward, he points to an old man sleeping on a bed in the far right corner. “That’s my grandfather,” he says. “His bladder is failing and we can’t have him around the kids all day.” Gulab says that all of his treatment has been free. One surgeon is less forgiving or optimistic about Jiva’s chance of survival. “These people will go to whoever will treat them first. Instead, they wait until their disease gets too extreme and then come to me. They expect me to fix it but I have to focus on the people who have a chance of living,” he says. As Jiva’s condition worsens, his family learns that his surgery has been delayed by another five hours. They sit on an adjacent bed, getting up every so often to re-position the oxygen tubes in his nose or prop his head on a pillow. It is unlikely that he will survive. Only days before, an equally critical scenario played out much differently. Lila Lasu, a twenty-two-year old housewife from another village arrived at the hospital after experiencing severe blood loss from a premature delivery. As soon as she was brought in, she received free and immediate diagnostic tests, covered by the Free Diagnosis Scheme, which revealed that she had a hemoglobin count of 6.2 g/Hb, acute hypertension, a slow pulse and a blood pressure of 90/60— all pointing to the need for swift and accurate treatment. Under the RFMS, she received free oral medication. In stable condition, she regained consciousness with the transfusion of a unit of B-positive blood and an IV of glucose. If she had not given birth at the CHC, which referred her to the gynecology ward of the District Hospital, there is a significant chance that she would have died. Lila Lasu receiving life-saving treatment. The common factor in both cases is that the medication is free, as are many of the medical services. What determines the effectiveness of the Free Medicine Scheme is if, and how quickly, the patient seeks help. Bridging the gap between traditional beliefs and modern medicine is complicated. Dr. Hemleta Jain sits in her office in a quiet corner of the District Hospital. She recites hymns under her breath as she massages essential oils into the temples of a coworker suffering a migraine (below). A large poster of a smiling guru is tacked to the wall above her desk, which is littered with prayer books. Dr. Jain is the Health Manager of the Banswara district. She has worked for UNICEF on projects ranging from Fluorosis control to Tuberculosis management, helped organize over 8,000 cataract surgeries, and has won three recognitions from the District Collector for her outreach efforts. Dr. Jain’s uncle was a saint, she explains, which is one of the reasons why she finds herself practicing spirituality on a regular basis. Every day, she meditates for two hours before starting her nine-hour shift, which is what gives her strength in her difficult job. There is something strikingly calm about Dr. Jain. She approaches patients in the same way that a bhopa might – spiritually; however, unlike bhopas, she has unwavering faith in the miracle of modern medicine. and a medical system that is largely alien to them. RFMS, to female students every Thursday, educating them on the concept of free medication and public healthcare at an early age. Programs like these have the potential to open lines of communication between accredited healthcare professionals and their target population. through green pastures and over newly formed streams. As he treks farther away from the Community Health Center and the whooshing of passing cars is replaced by the sound of bird calls, it becomes apparent that the Rajasthan Free Medicine Scheme is not just physically distant from Banswara’s tribal population; it exists in a completely different reality. The RFMS’ success does not merely depend on the familiarization of tribes with modern medicine but on its own ability to adjust to the lives of people like Bhura, Nathu Homa and Jiva, who will take their medicine today so that, by the grace of god, they can get back to work tomorrow.